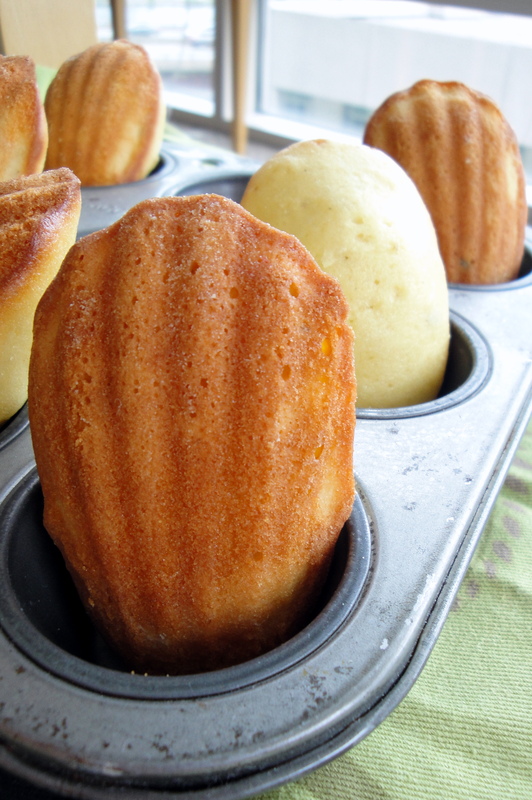 Madeleines have never really appealed to me — in pictures they are always adorable, but look extremely dry and lackluster. But there are just some things you have to try, regardless of any preconceptions. I mean, would they really sell something like madeleine pans if they weren’t making? 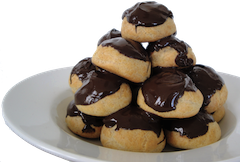 I’d come across a couple of madeleine recipes that looked good to me, so I decided to give both a shot. Each recipe only made a dozen cookies, so I figured I could make both recipes without going overboard. Sometimes I get the craving to bake everything (like today, when at the supermarket I bought ingredients for THREE recipes), but I have to always remind myself, someone’s got to eat this stuff! And if it’s going to be me, I certainly can’t make THAT much. Anyway, I’m getting side-tracked. 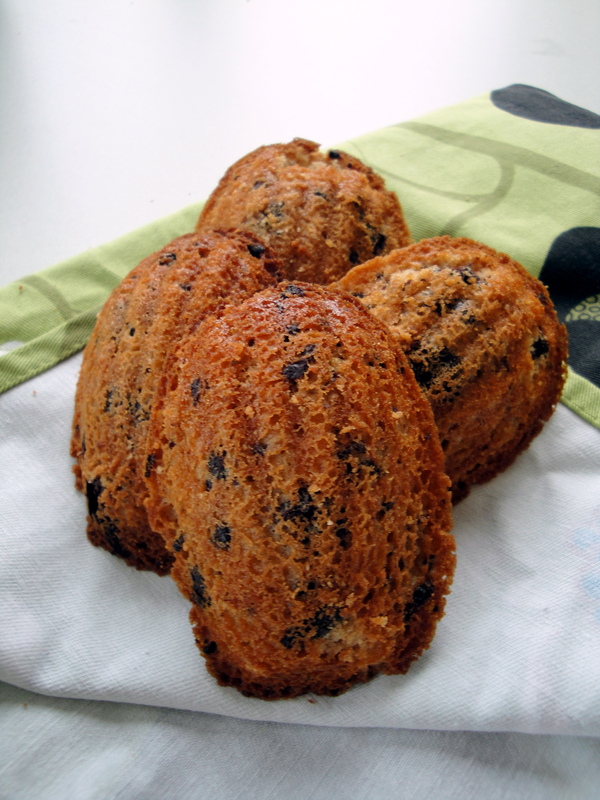 The recipes I chose couldn’t have been more different — one was for Chocolate Chip Madeleines (from the blog Technicolor Kitchen), and the other recipe was for Honey Lavender Madeleines (from The Purple Foodie). My mom gave me a big container of cooking lavender a while back, but I’d never used it, so I was excited to have found a recipe for it. I’ve always been concerned about incorporating something so floral into my food, for fear that it will completely overwhelm the other flavors, but the lavender in this recipe was overwhelmingly subtle. They had a wonderful balance of honey and lavender, and were light and fluffy, and as far as I can tell, pretty dead-on with an accurately baked madeleine. The chocolate chip madeleines, however, were a complete flop. I am a humble baker, and as such, I hope you’ll believe me when I say I don’t often screw up recipes. There have been times (AW and many of my family members can attest to them) when I’ve had too many things going on in the kitchen, and I accidentally leave out an ingredient, or do something completely opposite to what the recipe says, but for the most part, things seem to work out pretty well for me. But these madeleines were just not having it. I made both of the cookie doughs together, and let them have their several hours of chill time in the fridge. I cooked the chocolate chip ones first, because I figured those would be more popular with my roommates, and would get eaten right up. 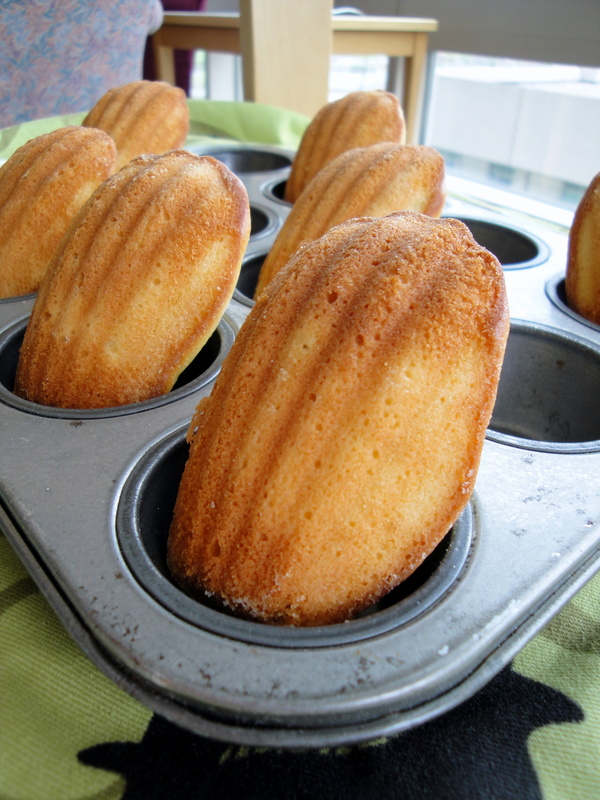 I was using nonstick pans, and as I’d read, you still need to grease them, just because madeleines can get finicky and don’t like to come out of the pans. So I did just that — sprayed them with a generous coating of PAM, and filled the molds up. I was very concerned with leveling the dough out (big mistake), which I later read would get sorted out in the oven. At any rate, they made it into the oven, only to come out 11 minutes later (when the cooking time specifically said 11-13 minutes) looking quite brown around the edges. I didn’t know if that was normal, but I figured it must be fine — I’d only put the cookies in for 11 minutes after all — and so I let them sit and cool (big mistake #2). Fifteen minutes or so later, I went back into the kitchen to take the cookies out of the molds, and they wouldn’t budge. AW was standing by watching with encouraging words, but it was no use — the cookies had no prayer. 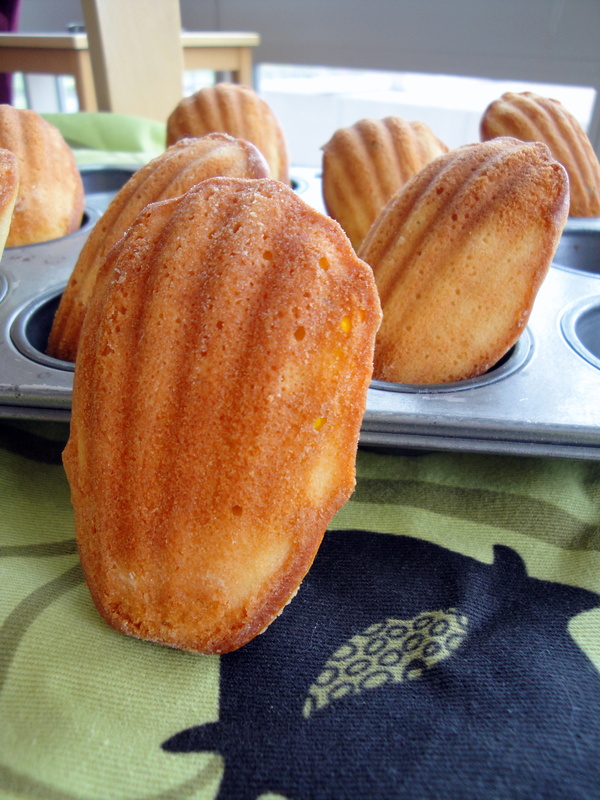 I was distraught — how could I have so royally screwed up my very first batch of madeleines? I ended up going at them with a butter knife, because I had no idea how else to remove them from the pan. Incredibly, I popped a few out that actually looked somewhat okay, so I snapped photos of those, and ate the rest as fast as I could. 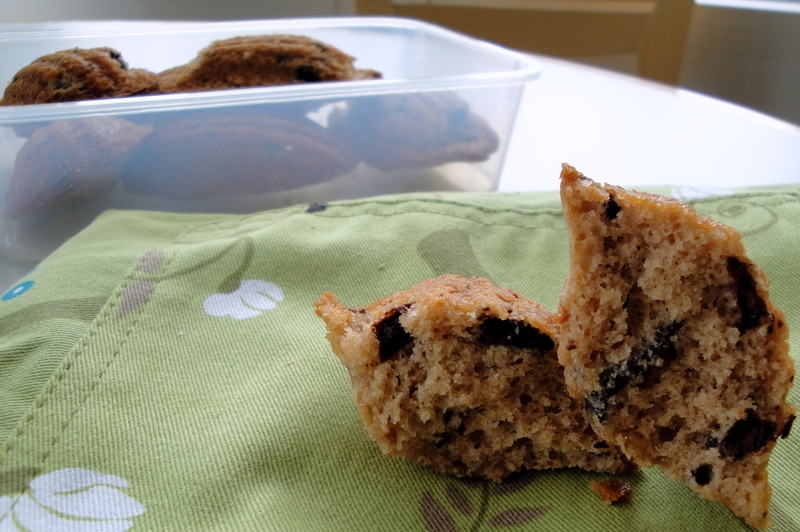 The cookies were too dry for my taste — the flavor was good, very vanilla-y, and the dark chocolate bits were really delish. But overall, I was just disappointed about the whole process. So I cleaned the pan and hoped for better results with the next batch. I made the honey lavender cookies on a whim the next morning. I was feeling impatient and really wanted to see some better results, so I rushed home from the gym and threw them in the oven. 11 minutes later (this time I checked up on them every few minutes just to be sure they weren’t burning), out came a pan full of perfectly cooked, beautifully shaped madeleines! The real thing! I promptly took them out of the pan, not wanting them to stick to the pan as the first batch had done, and layed them out to cool. They looked so pretty, and I have to say I was quite pleased with myself. This was right before brunch with AW and his family, so I had to hold off trying them until later in the day. When I finally had a bite, I was pleasantly surprised at the mild flavors. As I mentioned earlier, both the honey and the lavender flavors distinctly came through, but neither was overwhelming — they worked together perfectly to create a floral, sweet treat. Usual floral isn’t a word I’d want associated with my food, but here it totally worked. I gave AW a few cookies to send back to the owner of the madeleine pans I had borrowed, and ate a couple more myself. I still think they could have been a bit more moist, but I’ve truthfully not had a madeleine before, so I’m going to set out in pursuit of a good one, and see what I can make even better the next time. It’s been an extremely stressful week, so baking has been on the brain. I had a couple of hours free this afternoon, so I decided to make something, though I couldn’t figure out what. AW helped me pare the list down to three, then I grabbed ingredients for all of them. 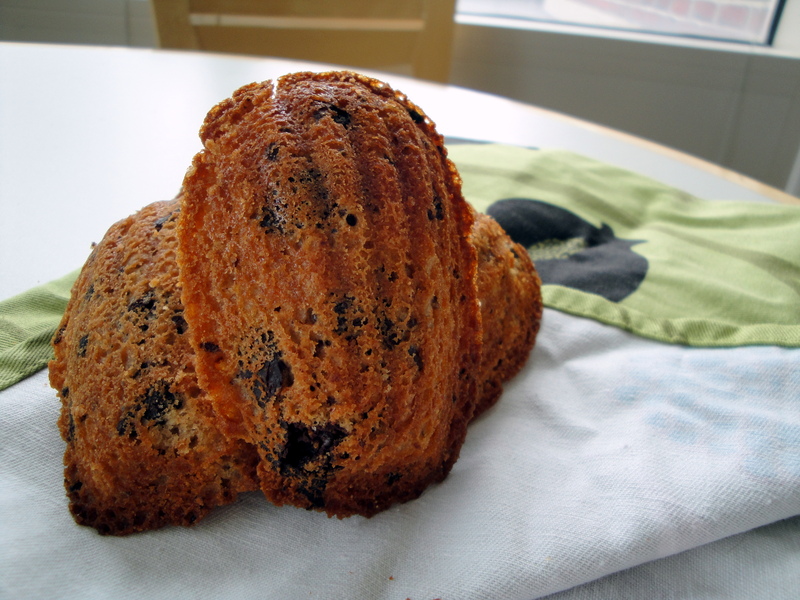 Today’s project came out of the oven about an hour ago, and it looks and tastes quite wonderful. I’ll be back to share that soon.